This past Sunday, Sept. 7, marked the first ‘Pizza with the Provost’ of the year. The event lasted from 6 to 8 p.m. in the Jane Bancroft Cook Library’s newly-constructed coffee bar. One hundred twenty-three students signed up to attend on a Google spreadsheet sent out by the Provost’s office prior to the event. Provost Barbara Feldman has been the driving force behind the new changes seen in the library this fall. This event gave her the opportunity to speak to students about how they feel in regards to the recent changes made. 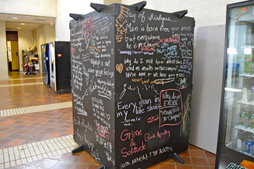 “I am here because of the big blue things,” second-year Olympia Fulcher said, referring to “Arthur,” a recent furniture addition to the library. “They are ugly as hell and cost $20,000. And they aren’t functional.” Fulcher live-streamed the event for those who could not attend. Students addressed Feldman directly, asking questions and sharing their thoughts on the recent changes. The biggest sentiment shared by students was the feeling of frustration over the lack of student input and lack of transparency concerning the renovations. Feldman stated that these changes are a part of the campus growth plan and that over the next few years, the campus will continue to change. In response to students’ concerns about not being asked about the library renovations, Feldman cited the time frame and the fact that students are rarely consulted in administrative matters. 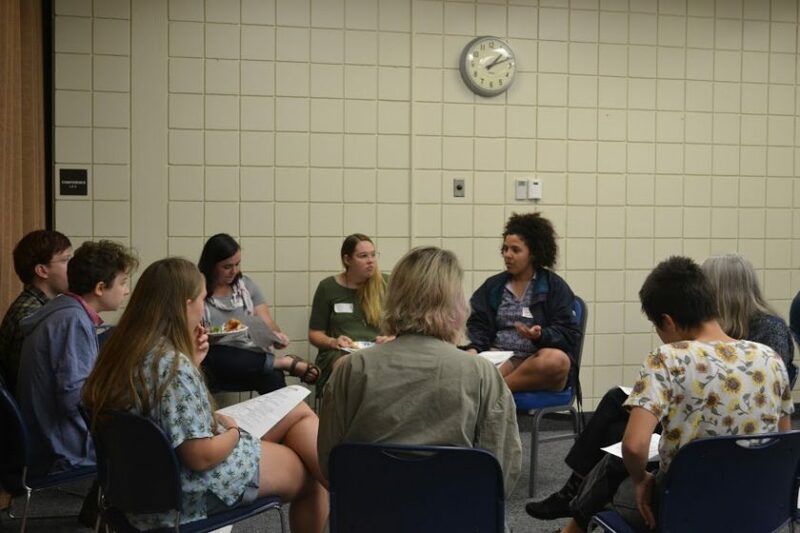 However, she is open to student input going forward, through the proper channels, which students believe will be the New College Student Alliance (NCSA), as the NCSA represents the student body. Due to the heated nature of the discussion and the fact that Feldman did not know she was being live-streamed for students who could not attend, she walked to the other side of the library to keep the discussion away from the stream. On the other side of the library, a more constructive discussion continued among a smaller group. Pizza with the Provost will be held the first Sunday of every month in the library coffee bar. Feldman requests that students arrange a meeting with her if they have questions, comments or concerns.